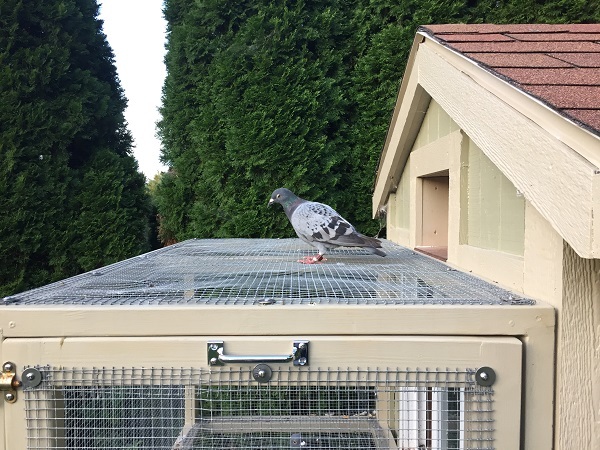 Do you remember the “Found Pigeon” that showed up at my loft last month? Well, the Zuzu look-alike came back! I was out at the loft feeding my birds, and I spotted her waiting by the trap door (which was locked at the time). At first, I thought her homing instinct must really have its signal scrambled. But then I realized this isn’t a matter of homing instinct, it’s a matter of the heart. The puzzle pieces clicked into place when I let my birds out for exercise. Dash is usually the first one to take off because he loves flying more than anything in the whole wide world. Or so I thought. Rather than taking off, Dash followed Zuzu #2 around in the grass, acting like a chicken, trying to win her affection. The best part? I captured it all on video!